Loving pet owners of two dogs and five cats. Our dog Daisy has a very sensitive stomach. Every Time we would give her store bought treats, she would get sick and vomit. Thats when we started baking homemade treats and wow, she wasn't getting sick anymore. 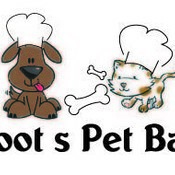 Ledfoots Pet Bakery was started to help everyone get the best healthy treats for you and your pet friends to enjoy. Your pet treats are made with the finest human grade ingredients. No preservatives, artificial coloring or flavoring. No sugar and animal by-products. If you do not see a treat on our list just let us know. We are glad to work with you on a one on one basis to meet your needs. If it's not good enough for our pets then it's not good enough for yours. All treats have been taste tested and dog/cat approved. So don't wait let them start living a healthier life today. Customer service is our #1 priority so place your order with confidence. LedfootsPetBakery doesn't have any items in their booth!